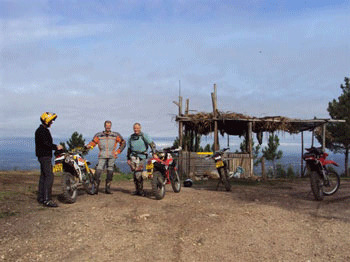 With thousands of miles of off road tracks and trails interlaced throughout the mountainous region of Central Portugal, starting right outside the villa, the off road riding experience can take you to places beyond the reach of normal roads. With hidden valleys, abandoned villages and views from mountain tops, our Suzuki DR250s can take you there. With a basic introduction to off road riding, the trails and tracks in this region open up a whole new world of motorcycling. We can take you on gentle unpaved roads or for the more adventurous, the more challenging tracks are out there. We provided packed lunches for picnics in stunning remote locations. We also supply body armour, boots, knee protectors and fuel. 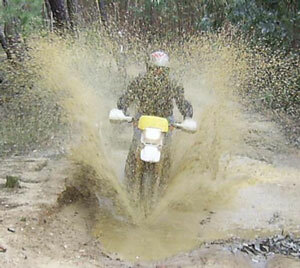 For our off road tours we provide Suzuki DR250s which are serviced and maintained at the local Suzuki dealers. We have chosen these bikes as they have a lowering linkage enabling us within half an hour to lower the bikes to accommodate the shorter rider. 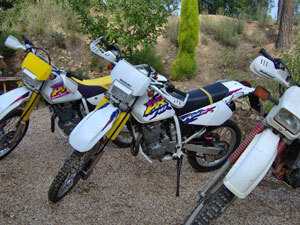 They have electric start, a comfortable seat for an off road bike – they are reliable and robust but lightweight. They have sufficient power to tackle the terrain on the tours without being so powerful that a novice rider can find themselves overwhelmed. In all, they do the job and inspire confidence.